Hello Nosh Show listeners! Time for our final show of 2016. I know that sounds sad but Episode 95 has lots of ice cream in it so that's a good thing right? 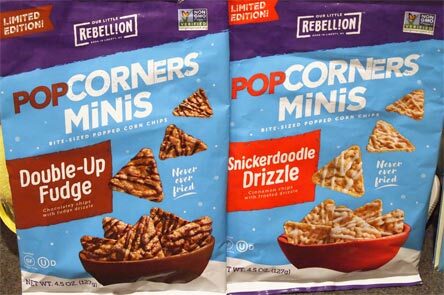 These are the limited edition popcorners minis in double-up fudge and snickerdoodle drizzle. I do go through a bag of "carnival kettle" popcorners (or the competing brand) from time to time so it wasn't a stretch for me to grab these on sale (2/$5 a Stop & Shop, 2/$4 at Market Basket). I tried the chocolate one first and it's got a fun chocolate kick to it. The drizzle is only on one side so you want to put that side down on your tastebuds for full affect. The snickerdoodle is a little more shocking/different. Rather than being a sweet, run of the mill cinnamon, they seem to have gone with one of the fancier cinnamons. I know that sounds dumb, but I'm hoping you know what I mean. It's got a little kick but as long as you keep that drizzle side down you will be just fine. On Second Scoop: I bought several more bags of the chocolate version. I think I set my expectations a little too high for these new Hersheys Cookie Layer Crunch bars. 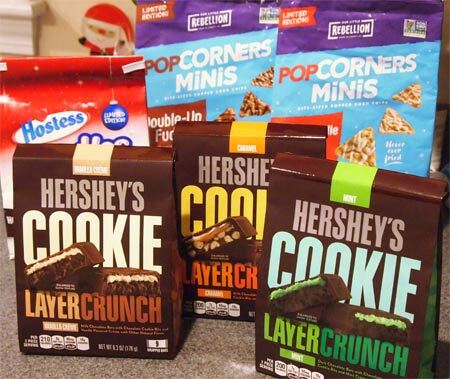 In particular, I was expecting more crunch because COOKIE is the biggest word on the bag (but not the bar itself). If you look closely though, notice that it's cookie bits and not a full cookie layer here. I guess I was expecting a twix but got a crunchy Hershey's bar instead. 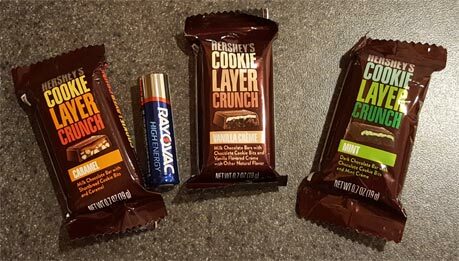 The fact that I'm not a huge fan of Hershey's regular chocolate doesn't help here. Since the bar is fairly thick, the other ingredients don't always have an easy time of overriding that familiar flavor. Not they have been growing on me as I have one or two a day, but I would like a bit less chocolate for a better overall balance. I'd say try them if you want, just pick the flavor you think fits your style and don't buy all three bags at once like I did (though for me I got drawn in by the B2G1 deal). 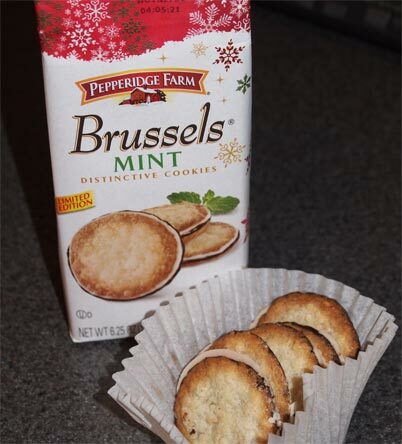 These are the new Pepperidge Farms Mint Brussles cookies that Marvo recommended in Episode 92. I wasn't sure how I felt about them at first but then I couldn't stop eating them. I've always loved Brussels so it wasn't hard to make that leap to the devouring stage. They don't taste like I expected I guess. Well, that's not totally true. You would probably figure that a non-chocolate cookie wafer would lead to an overall less chocolatey combo and it does. The crunch is fun as always but the mint layer changes the cookie to filling ratio that you get from a regular Brussels. I enjoyed the difference. 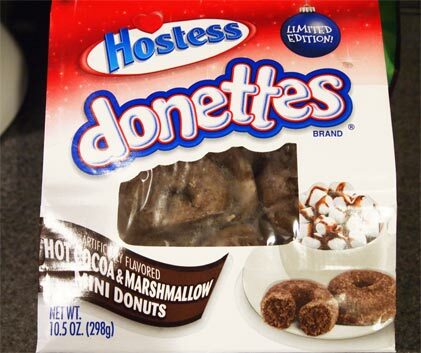 Hostess mini Hot Cocoa donuts. I love chocolate cake donuts. I have eaten oh so many of them. This is no fresh cake donut. Yes, for the first second, your brain is going to be reminded of a glazed chocolate cake donut, but after a few chews, that misconception falls apart. It becomes this gummy mess in your mouth that you have to choke down. Ok, choke is a strong word, but I have zero interest in eating any more of these. I did try another one the following day but it was still terrible in my mind. Feel free to skip these. Ok, random snacking is over. I did mention at the beginning of the episode that I have been trying lots of things just not necessarily stuff that is on our nosh or not list. If you've had any of these, feel free to chime in with your thoughts. Have a good week everyone!